RSP Nutrition is one of those companies that can fly under the radar. They aren’t the most flashy, or the loudest marketers, or even a company that you hear your friends talk about. They are like the quiet guy in the back of class who silently goes about his business and gets an A without trying. So how do you even notice that silent kid in the back of the class? Well. I was placing my biweekly supplement order from bodybuilding.com and figured I’d browse for a new fat burner to try. 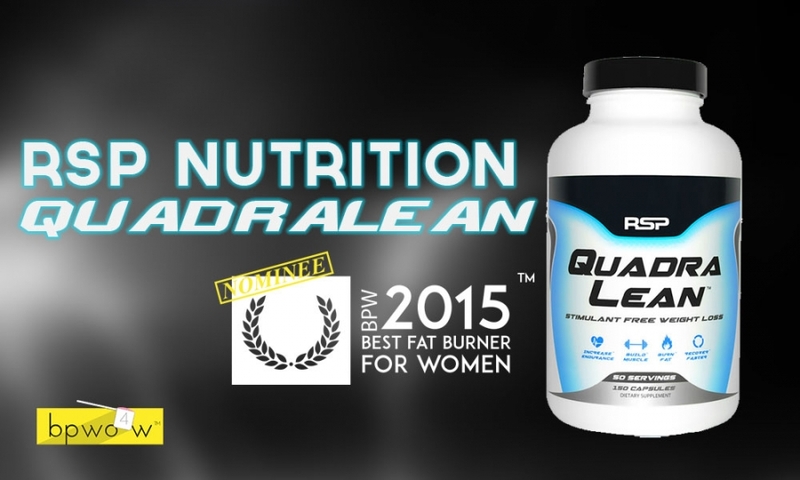 Much to my surprise, the very first product on the top of the list by default is RSP’s Quadralean fat burner. I honestly couldn’t even remember if I’d even heard of this company before. It’s got such a nondescript name and such bland packaging that I could’ve seen it hundreds if not thousands of times on shelves and just browsed right over it. But that’s exactly why I decided to pick up a bottle. Because let me tell you something about big-time retailers like bodybuilding.com. They probably have a full-time employee who decides which products to bump up to the top of that page. Because that webpage probably gets thousands of views a day. And their job is to maximize the orders that they get from each page view. And that means their is something about Quadralean that is favorable. It could be that the product has wide margins- meaning bb.com makes a good profit on each bottle of Quadralean sold versus some of the other fat burners. Or. (And this is what I was hoping for), the product is fantastic, and they know that if they can sell one bottle, they will have repeat customers who will re-purchase the item. So. Was this the case? Let me tell you the effects that I saw on my body and help you answer the question that I’m sure is at the top of your mind: Does RSP Quadralean Work? Week 1: The first week that I took RSP Quadralean was mostly an adjustment period for my body. As is such, I don’t think I noticed any significant changes. In fact I ended up bumping up my caloric intake because I started doing a new workout program that required two workouts per day. I think during the first week that I was on Quadralean I may have overcompensated because I’m pretty sure I gained a tiny bit of weight during it. Despite the weight gain however, I looked identical in terms of body fat. So I think Quadralean probably helped mitigate the effects. Week 2: During the second week on Quadralean, I dialed in my calories and got my macros sorted out so that I could see what this product was really capable of. Towards the end of this second week is when I really got a taste of the results. The definition in my shoulders and upper back was really starting to get more defined. And the extra cardio that I was doing was starting to make my calf muscles and lower quads more toned. Quadralean absolutely helped me start to see these results faster than I would have without it. Week 3: The third week is the real money-maker for Quadralean. This is when you can expect to really start to see the effects come to life on your physique. The areas where I noticed the most impact were still in my back and shoulders, and then legs from mid-thigh down. What you have to keep in mind is that the effects that you get are going to map back to what sort of training you are doing. In my case, the effects were much more noticeable in those areas that I mentioned. A large part of that has to be due to the fact that my training was hitting those body parts in ways that I wasn’t used to- therefore causing the body to adapt and change accordingly. So Quadralean certainly had some effect on helping me drop body fat and get more defined. Let’s dive into the supplement facts and talk about what ingredients are in here, and how they help contribute to the products fat burning effect. To summarize: what you’re getting with this product from a formula standpoint is mostly CLA supported by various types of Carnitine- which is essentially the fat burning amino. I do wish RSP had broken out the Carnitine blend so that we could see exactly what amounts of the different types of Carnitine they put in here. But overall it’s not a poorly developed ingredient list at all. Let’s talk about the label now. Meh. That’s how I feel about how this product looks. I bet you probably feel the same way. It’s just not very good in my expert opinion. For the breakout brand of the year, you would expect a little more in the looks department. It’s a boring white bottle with a boring black lid and a boring, white and blue color scheme. I guess my biggest issue with it is that I have no emotional connection to it. I look at it and I feel nothing. I want to be able to glance at it quickly and immediately know what it does. Not by reading fine print, or even the product name, but just by glancing and then looking away. That does not happen with Quadralean. On the flipside- there are some things right with RSP packaging. First of all, all the products share a consistent theme and look. You will notice some brands are all over the place with their packaging such that you can’t even tell what products belong under the same brand. But with RSP there is no question. you immediately know from the electric blue gradient complemented by black and white, that this is in fact an RSP Nutrition Product. Another thing that RSP got right is making the product name very prominent and it does echo the purpose of the product quite well. I also think they did a tasteful job of integrating the little benefits icons into the design. So I guess it’s not such a bad design after all, it just lacks that ‘wow’ factor. They say the whole is greater than the sum of the parts. And that’s what’s going on with RSP’s Quadralean. Is it the most crazily effective fat burner that I’ve ever tried that melts the fat from your body? No. Is it the pretties package sitting on the shelf? No. But here’s what it is- an effective stimulant free fat burner that is smartly formulated and fairly priced. I would recommend giving it a shot- I think you’ll find that you agree whole-heartedly with my Quadralean review.